Your child should be naturally proud of his or her smile. It expresses joy, laughter, and fun! To make sure your child has a healthy and appealing smile, start early. Really early. Doctor Larry Johnson recommends that you bring your child in for their first dental visit soon after their first birthday. An early check is the first step in preventing issues and setting the stage for lifelong dental health. Doctor Johnson will keep the visit short, but carry out a thorough visual examination to make sure there are no concerns. Doctor Johnson will counsel you on good dental procedures at home, such as correct brushing and flossing. You will also be guided regarding healthy eating choices and the impact of poor choices. It is especially important to keep your toddler from eating sticky or hard candies that lodge in molars and spaces between teeth. It is also important to monitor the amount of juice they drink and keep it in a cup instead of a bottle. Any time sugary foods or drinks are in contact with teeth, the enamel is weakened from the acid those substances contain. Prolonged exposure begins to wear the enamel away, setting the stage for cavities. Unlike broken bones that regenerate, once enamel is gone, it’s essentially gone, though fluoride can remineralize weakened enamel to a small degree. Before coming to Cornertown Dentistry in Anytown, speak with your child about the upcoming appointment and let them know that their teeth are going to be checked. Dr. Johnson will help your child feel proud of their effort and help them have a positive visit, the first of many to come. Call Dr. Johnson at 801.938.3466 to schedule an appointment. Remember also to call any time between scheduled visits with any questions or concerns that might arise. 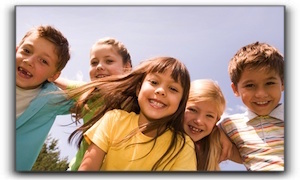 We are committed to your child’s lifelong dental health. Dr. Johnson serves many families in the Salt Lake City area with proficiency and compassion. Some of our patients come from Provo, St. George, and Moab. At Cornertown Dentistry, we love working with children and will help your child have a pleasing experience learning to care for their teeth. At Cornertown Dentistry, we focus our efforts on . Each member of our remarketable team is passionate about making our youngest patients feel safe and comfortable. Our patients enjoy the friendly atmosphere while benefitting from our state-of-the-art technology. Some of our most popular services include cleaning and prevention, restorations and dental surgery. We are located at 123 North Main in Anytown.